As you all know, Shelley wears several hats; writing as S L Wilson she is the author of the most wonderful young adult fantasy novels, which blend a love of the supernatural with strong female protagonists and include the fabulous The Guardians Series. And Shelley’s non-fiction work is rooted in a passion for helping women to believe in themselves and become strong, motivated individuals. Can you spot the common thread between the two genres? Her non-fiction books include How I Changed My Life In A Year – which is amazing!! – and the Well-Being Workshops Series. ES: Welcome to Hot Holidays! I’m thrilled to have you as our guest today. ES: So, let’s get started! Shelley, where did you spend your last holiday and why did you choose to go there? SW: I have an odd fascination with water; either sailing over it, sitting by it, or paddling in it! Beach holidays were a favourite when I was younger, but nowadays I prefer to alternate lazy days with a spot of culture, so when I suggested Lake Garda, Italy to my children and parents they jumped at the chance. We stayed in the South of the lake at the beautiful spot of Desenzano. This resort is within easy reach of the airport, train links, a huge theme park and the stunning city of Verona. We booked as a package holiday so had the benefit of a hilarious resort host who guided us to choose the best trips, restaurants and child-friendly bars. The rest of the lake is easily accessible using the regular ferry services. To tour the entire lake would occupy you all day as it takes four hours to travel from the North to South, however, the ferry stops at all the local towns so you can hop on and off. I have to say that Sirmione is my favourite resort so far. ES: How wonderful! I absolutely love Lake Garda, too. Although you’ve partly answered this question already, what’s your favourite type of holiday? SW: My parents are sun worshippers, and so my childhood was full of beach holidays to Cornwall – yes, the sun did occasionally shine in the UK. When I was thirteen, we took our first family holiday abroad. We stopped in Portinax, Ibiza and loved it so much we returned year after year. When I had my own family, I followed this set routine of beach holidays, but as a fan of history, I longed to visit the various castles, churches, forts, and old towns. When I got divorced, it gave me the opportunity to take my three children on more cultural trips. My favourite type of holiday would be a city break with the added advantage of a pool or beach so that we could indulge in a lazy day in between the sightseeing. ES: That sounds perfect. And your least favourite? SW: I don’t have a least favourite type of holiday as we’ve tried most things and loved them all – even camping! ES: Hmm, I was with you until the camping. (My idea of hell!) Please tell us where you spent your best ever holiday and what made it so memorable? SW: As I’m a single mum with three teenage children, I tend to look out for quirky holidays that will delight them (teens are a tough audience) and so we’ve slept in a pod in Sherwood Forest, hired a 1969 VW campervan and toured the Isle of Wight, been on a Mediterranean cruise, hired a flat in Cornwall, and camped in York during the floods! 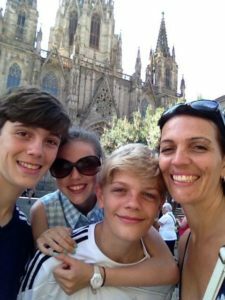 Even though I’ve been a single parent for the past twelve years, I never had the confidence to take them abroad on my own, but after we had done the Mediterranean cruise with my parents, I felt more prepared to take them on a city break to one of the places we’d visited on that trip. I opted for a five-night stay in Barcelona. Everything was perfect. I managed to get the three kids sat together on the plane so they could look out for one another and I was only across the centre aisle. I’d pre-booked a taxi to pick us up at the airport and take us to the hotel. Once we’d checked in and unpacked, we set out to explore. As the kids are older, they took charge of the map, and it was fabulous to watch their confidence grow as they directed us around the city. We must have walked hundreds of miles! We did everything – Barcelona FC, Font Magica, Barcelona Zoo, Boat Trip around the harbour, Gaudi, shopping, and a lazy beach day mid-week. They still talk about that trip today. Watching them embrace the culture, try out the language, and enjoy themselves so much was so memorable – and for me, it was a huge boost for my single mum confidence that we survived to tell the tale! ES: That’s fantastic. Barcelona has a special place in my heart as my daughter was born there, but I love the way you all embraced everything about the holiday. Your children sound amazing! SW: I’m very fortunate that the only slight issue we’ve ever had on any trip is the lack of a camp bed in our room for one of my children. Attempting to explain this to the Spanish handyman was hilarious, but we got there in the end. I hope our good travel luck continues for many years. ES: Please tell us about a place you long to visit and the reasons why. SW: Middle-earth! No, really – you can go! Hobbiton is in New Zealand and is the film set used in the Lord of the Rings movie. I can just imagine having a drink in the Green Dragon Inn and then wandering over the double arched bridge – bliss. ES: LOL! Sounds like it would be right up your street! Who’s your favourite travelling companion(s) or do you prefer your own company? I did go on a singles’ holiday back in 2006, so I don’t have any concerns about travelling on my own. That trip was brilliant, and I made some great friends. ES: A singles’ holiday? We need to talk! LOL. And perhaps following on from that….have you ever had a holiday romance? Details, please! SW: I wish! The only holiday romance I’ve ever had involved PG snogging as I would have been in my teens. I did wonder if the singles’ holiday would reap any romantic moments for me but upon arrival, I realised I was the youngest member of the group by about twenty years – no romance but plenty of adoptive parents’! ES: Well, I think that’s the great thing about a singles’ holiday – most people get on well and make friends, don’t they? Now, how would you spend your dream twenty-four hours if you could travel to multiple, worldwide destinations with no travel restrictions? SW: Oh, my writer brain just went into overdrive. Am I allowed to fantasise about my travelling companion too? ES: Of course! It’s your fantasy! Oh okay, I’ll be sensible. I would start at Hobbiton in New Zealand and then make my way to Sydney in Australia. Then I’d leap into the Tardis and head to Pompeii. I’d travel to Peru and find the easiest route to Macchu Picchu. Then I would head to America and try to hit every state. If time allowed, I’d also visit India. ES: Brilliant choices! With JD all the way! And what tip or piece of advice would you give to holidaymakers and/or travellers? SW: Don’t let fear stop you from seeing the world. We are so fortunate to be able to reach such wondrous places relatively easily. Yes, money may be a factor, but if you plan, save, and organise efficiently, then anything – or anywhere – is possible. ES: That’s fabulous advice, Shelley! Thank you so much for taking part. Enjoy your next trip! This entry was posted in Hot Holidays and tagged How I Changed My Life In A Year, S L Wilson, Shelley Wilson, The Guardians, Wellbeing Workshops by Elaine Spires. Bookmark the permalink.